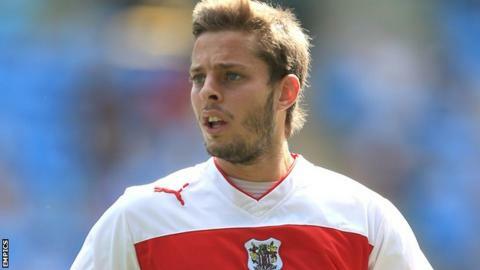 Robin Shroot netted an injury-time winner as Stevenage came from behind to beat Notts County. After a goalless first half, referee Darren Drysdale awarded three spot-kicks after the break. The Magpies' regular penalty taker Jeff Hughes hit the post with his effort, but Jamal Campbell-Ryce made amends after Francois Zoko was fouled. Notts sub Alan Sheehan was sent off for handball with Lucas Atkins netting from the spot, before Shroot's late winner. Stevenage replace Notts County in second in League One and the Mapgies slip to fourth. The hosts started brighter, as Alan Judge and Neal Bishop fired over the bar, while Zoko's header was punched away by Steve Arnold. At the other end, Akins and Greg Tansey forced good saves from Magpies goalkeeper Bartosz Bialkowski. Hughes was brought down by Akins after the break but saw his spot-kick hit the left-hand post and, when Zoko was felled by Mark Roberts, Campbell-Ryce put Notts ahead. Sheenan, who had only been on the field for seven minutes as a second-half substitute, was dismissed after handling Marcus Haber's goal-bound shot on the line and Atkins converted from the spot. Haber then set up substitute Shroot for a dramatic winner as Notts were beaten at home for the second time this season. "Stevenage came with a game plan to come here and frustrate from minute one. "I think, in their own minds, if they were to get a point they would've been more than happy but they have nicked all three. "It is a learning curve for the players. You have got to know where you are in the game and where you are on the pitch." "It was a hell of a night and I thought there was some really competitive football. "Notts County had the lion's share of possession, as you'd expect at home. "Defensively we looked very good, very solid. "I thought the first penalty was very suspect. The second was a clearer shout. But with the man advantage, we pushed on and got all three points."